Original Australian Daybill movie poster. 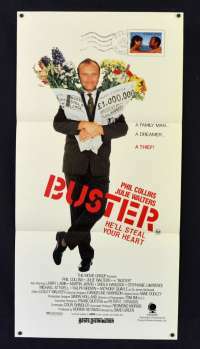 Buster is a 1988 British romantic comedy-drama crime film based on characters and events from the Great Train Robbery (1963). 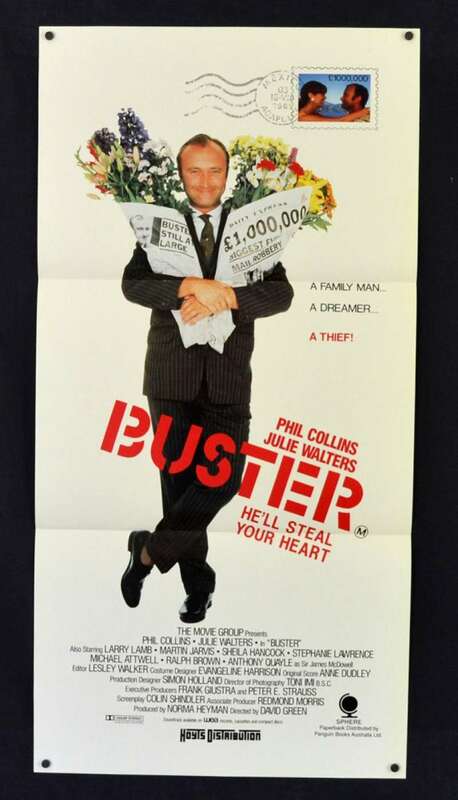 It stars musician Phil Collins, Julie Walters, Larry Lamb and Sheila Hancock. Several Phil Collins singles were released from the soundtrack, including "A Groovy Kind of Love" and "Two Hearts", which reached #1 and #6 on the UK Singles Chart, respectively. Both songs were number one singles in the US. "Two Hearts" received an Academy Award nomination for Best Original Song, a Grammy Award for Best Song written specifically for a Motion Picture or Television and a Golden Globe Award for Best Original Song.